Happy New Year to all, let’s hope that this year is as good for growth as the year just past. I don’t think I can remember a year where so much growth was produced. Things that I planted out early on in the year really established well and so with that in mind I will try and do the same this year. 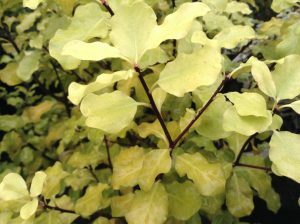 This month I am looking at some of the background plants in the garden – the evergreens. At this time of the year the structural plants of the garden are more noticeable i.e. hedges and specimens. Evergreens are often underrated for what they add to the garden but at this time of the year they play their part especially when covered in frost or a light dusting of snow. Probably one of the most versatile evergreens that you can use for hedging or topiary as in the picture. It can grow in almost any position being tolerant of both sun and part shade. It will also grow on a wide range of soil types (except the very wettest of soils). It creates a very dense hedge which is strong and more vigorous than people think. This allows you to be able to cut it into quite intricate shapes which can look fantastic, especially with the setting sun behind. You can be as daring as you wish with what you decide to create be it a peacock, mushroom, fish or crane! This reasonably new variety is great for a shady spot in the garden where it will show off all year! 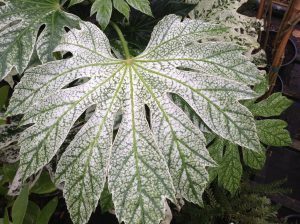 The leaves are covered in little white dots which join together to form larger white patches between the veins which gives it that ghostly appearance. Like the straight green form it creates a tropical effect. Looks great in an ornate pot in a shady courtyard or on a north facing wall. This is one of my favourites of the Pittosporums as it’s a bit odd! In the spring and summer it is a plain green colour but as the nights get longer and the days get cooler it starts to transform into the most beautiful shade of lemon. The leaves contrast really well against the shiny black stems and twigs during the winter. Like all Pittosporums it does not like a cold wind so it needs a sheltered site but this does not mean it needs to be hidden away. It makes a lovely statement plant when planted amongst other shrubs. And unlike a lot of this group of plants it will tolerate some shade. It will need pruning from time to time to keep it under control as it will get large up to 3m (10ft) or so. If you do need to prune it then never cut into old wood where there are no leaves as it does not re-grow, always leave at least one pair of leaves on a stem to encourage new growth. Not really a background plant but I just had to put this into the mix this month as again it’s one of my favourites for this time of the year. This lovely evergreen flowers from October through until April in most years but needs a sheltered spot in a south facing position with good drainage. The silver grey scaly foliage is very rounded and looks great against the long tubular white or slightly green flowers. 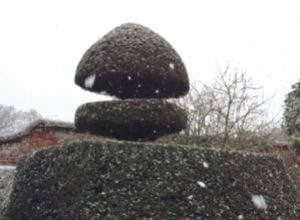 If we get snow you will need to keep an eye on this shrub as it is quite brittle and can break. There are several good forms of this plant such as C. backhousiana which gets to a similar height 1.2-1.5m (4-5ft) and has brown tinged tubular flowers and C. ‘Marion’s Marvel’ which has two tone tubular flowers of pink and green. 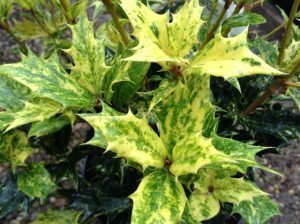 A slow growing bushy evergreen with golden splashed holly-like foliage. Although it looks like holly the leaves are not as prickly. This will tolerate all sorts of conditions in the garden being able to grow in full sun or shade and in any soil type except the wettest of soils therefore making it a very versatile plant. On mature plants flowers will be produced in late summer which are pure white and fragrant. Its eye-catching foliage makes it ideal for a mixed border or as a stand-alone specimen. Being quite tough it also does well in cooler spots of the garden where frost can be a problem. 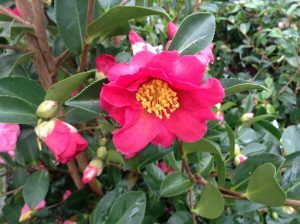 Another plant that has been performing for a while now, in fact the autumn flowering Camellias have been in bloom since the end of October! This one will get to 2m (6-8ft) and thrives in a semi-shade in a good humus rich acidic soil. 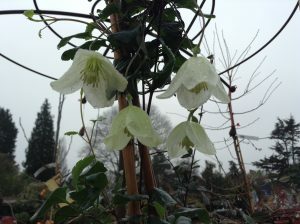 ‘Kanijiro’ is one of the longest flowered forms and will keep flowering through until end of February. If you are lucky enough to have a conservatory or a nice cool porch you could plant it in a pot and bring it in for this time of the year and enjoy its sweet lightly fragrant flowers. Other good autumn and winter flowering Camellias include C. sasanqua ‘Hugh Evans’ with its scented slightly curled pale pink flowers or C. sasanqua ‘Rainbow’ with its scented white flowers which are suffused with pink. This is one of those plants that look as if it will perish as soon as the frost arrives but it is one of the toughest little evergreens around. It is best planted in fertile humus rich soil that is well drained but moisture retentive. Like all Clematis it likes a cool root run, so will benefit from having its roots shaded at all times whether that be by gravel, slates or just good under-planting. 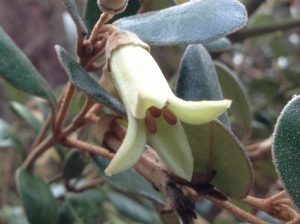 The delicate nodding creamy-green flowers appear throughout the late autumn and winter and contrast nicely with the deep green leaves. On milder days it has a very light almond fragrance but you do need a good sense of smell to detect it! Grow it through other climbers such as climbing roses or through trellis where it will make quite a show. I have it growing through an old climbing rose and some ivy (Hedera helix) and it looks great. C. ‘Freckles’ with its deep maroon blotches is another variant if you want a bit more colour which works well over a pergola so that you can look up into those drooping flowers! Tidy your borders – With spring on the way now is the time to start looking at the borders in the garden. Cut down the remains of last year’s herbaceous perennials, have any outgrown there space? Do they need lifting and splitting? Or did they not perform as you would like? These are questions that you may find yourself asking at this time of the year. You can, as long as it’s not too wet or frosty, get all of these jobs under way this month. Lift and split those that are congested or have grown into other plants. This will encourage healthy new growth and often more flowers and will give you more plants to play with. I always use an old pruning saw to divide my herbaceous perennials as this gives you a nice clean cut. Dig up the clump that has got too big with a fork or spade trying to reduce the risk of tearing the clump and place it on a flat surface. Then using the saw cut it into as many pieces as you see fit, as long as you have some root and a growing point visible on each section. Then when you have divided it up seal the edges with some yellow sulphur or last years old rooting powder! This reduces the risk of the cut edges rotting. Then all you have to do is replant it to the same depth as it was in the border and it should grow away with added vigour this year. Anything extra can be potted up and given away to friends and relations. For the plants that did not perform, either be ruthless and dig them out and try something else or give them another year to establish and feed and care for them and see what happens. Our annual early tour of the garden with Rupert Eley the owner. Come and see the garden before it is generally open and listen to Rupert’s vast knowledge of all things Horticultural. Rupert will guide you around the garden and tell you some of its history and look at the plants that are at their best this season. Tickets £19 (RHS members £15) – ticket includes tea/coffee and cake on arrival. Booking advised for this ever popular event. Please wear stout shoes or boots as the garden is slippery at this time of the year.